Whole Women’s Health (WWH) soon set up shop in Las Cruces where it could continue its substandard operations without accountability. With much fanfare, WWH announced that it would open for business on September 15, 2014, with the intention of targeting Texas women for abortions, encouraging them to cross state lines where they could avoid waiting periods and parental consent laws for minors. However, when that day arrived, pro-life supporters who visited the new clinic location discovered a darkened and obviously closed office. WWH cited undefined “logistical issues” as a reason for the delay. Nearly three weeks ago, Whole Women’s Health in Las Cruces quietly opened for business. Pro-life supporters from 40 Days for Life reported witnessing a steady stream of women coming and going from the facility. Martha Beasley, a pro-life activist who managed prayer vigils at the clinic, repeatedly called city offices and questioned whether the new abortion business was properly permitted and zoned for surgeries. In a call placed by Tara Shaver of Protest ABQ on October 17, 2014, a Las Cruces code officer told her that the abortion clinic claimed to have a valid business permit. That permit, it turns out, belonged to Vista Surgical Associates, the previous medical business that occupied that office, and was improperly passed off by WWH employees as their own. The code officer later admitted to Shaver that the office “was in the process of getting” their business license. However, that proved not to be the case. At the time of this call, the abortion facility had made no effort to obtain a business license. Further questions prompted additional inquiries to the clinic by the code officer, where WWH personnel convinced him that they were not seeing patients. They wrongly claimed the steady stream of traffic into the office was simply employees, contractors, or venders who were helping to get the business set up. However, recorded telephone conversations documented the fact that the Las Cruces Whole Women’s Health facility was in fact conducting surgical abortions and other services illegally up until the afternoon of October 27. Tara Shaver of Protest ABQ and this correspondent each made recorded calls seeking abortion appointments at Whole Women’s Health in Las Cruces. Shaver placed her call on Thursday, October 16, 2014, received an appointment for an abortion on October 21. I placed a call to WWH on October 21 and received an offer of a surgical abortion appointment for the following day, October 22. A WWH employee told Shaver to plan on being at the clinic for up to five hours after the abortion procedure. She was also told that they were currently doing abortions up to 12 weeks of pregnancy, but that would expand as they developed a “clientele” in New Mexico. I was told during my call that only surgical abortions were available at the Las Cruces office. Although I posed as a woman only seeking information, I was heavily pressured to schedule the abortion for the following day. I was told that my concerns would be addressed during my appointment. During both phone calls, questions about who would be providing the abortions was met with evasiveness and non-answers. Late Monday, October 27, a business permit was finally issued — but not to Whole Women’s Health. Instead, the permit is in the name of their heretofore secret abortionist’s newly-created New Mexico company. After weeks of refusing to identify their abortion provider, just days ago, Whole Women’s Health announced on their website that their Las Cruces provider is William H. Richardson, a Tuscon abortionist who is best known for filing a lawsuit in 2009 that unsuccessfully challenged the constitutionality of Arizona abortion laws. Richardson, who operates Tuscon Women’s Center, is a former abortionist for Planned Parenthood who was first licensed in Arizona in 1989. In 1993, the Pima County Health Department placed a “Letter of Concern” in his file for a recordkeeping lapse. He was granted a license to practice in New Mexico just four months ago on June 13, 2014. 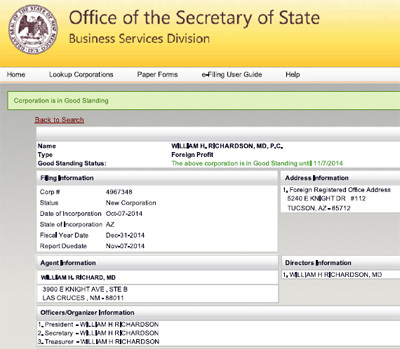 On October 4, 2014 — two weeks after WWH’s planned opening — Richardson created a new company, “William H. Richardson, MD, PC,” for his work at the Las Cruces Whole Women’s Health, but when registering the new company with the New Mexico Secretary of State, he apparently confused the Las Cruces address, which is located on East Loman Avenue, with his Tuscon abortion clinic, which is located on East Knight Avenue. He mistakenly reported his new Las Cruces address as 3900 East Knight. The official name of the Las Cruces abortion business now appears to be “William H. Richardson, MD, PC.” The Whole Women’s Heath website refers to it as “Whole Woman’s Health of New Mexico, Medical Practice of William H. Richardson, MD, PC.” However, all the permit applications and business filings were all done under Richardson’s company name. Nothing has been filed under the Whole Women’s Health moniker. The dual name appears intentionally confusing, especially since Richardson facility is referred to as “Whole Women’s Health” when doing business. There is also question about whether the East Loman building is properly zoned for surgical abortions. The zoning approval boxes on Richardson’s business permit application were left blank, indicating that zoning approval was not sought. The second trimester abortions cannot be considered “minor” medical procedures since they would involve multi-day procedures that are much riskier than those done in the first trimester. Surgical abortions, particularly those done after 12 weeks, have resulted in documented patient injuries and deaths. The facility appears to be in a zone that is incompatible with those practices. Could it be that the WWH/Richardson abortion enterprise is again using deception to evade zoning requirements? Newman’s concerns are valid ones based on Whole Women’s Health history of health and safety violations. In Texas, a 2011 Operation Rescue investigation documented violations at Whole Women’s Health in Austin and McAllen involving the illegal dumping of recognizable aborted baby remains in a public dumpster. The two abortion centers were heavily fined as a result. In addition, Operation Rescue reported two Whole Women’s Health abortionists, Alan H. Molson and Robert E. Hanson, for violations discovered during that same investigation, resulting in thousands of dollars in fines. Molson, 62, admitted that he was not routinely present for post-abortion follow-up visits, which were done by unqualified medical assistants, who also improperly handed out prescriptions for birth control pills that were pre-signed by Molson. Hanson, 74, admitted that he saw patients for the first time on the day of the abortion and failed take complete medical histories or conduct proper physical exams. He also admitted to inadequately monitoring vital signs during abortions. Since New Mexico has no laws that would hold abortion facilities accountable to meeting any kind of safety standards, it falls to each city in that state to protect citizens from substandard businesses that pose credible risks to public safety, as does the WWH/Richardson abortion business. While the fine for operating without a valid business permit is only $500, it is possible for the City Las Cruces to revoke a permit once it is issued. Please contact Robert Kyle, and ask that his department revoke the business permit issued to William H. Richardson, MD, PC due to safety concerns and given the checkered history of the Whole Women’s Health abortion chain in Texas with which his abortion business is affiliated.